The Institut français d’Ecosse is happy to host an event organised by Stills Centre for Photography featuring renowned contemporary artist, Daniel Buren. The artist will visit Edinburgh to present a lecture on photography - outlining his thoughts on the medium and the vital role that photography plays as a tool for documenting his work. Daniel Buren is widely considered to be one of the most important figures in contemporary art. At the end of the1960s, he abandoned traditional painting and developed a radical form of conceptual art, adopting 8.7cm wide vertical stripes (1965) and using them as a ‘visual tool’ to prompt a reading of the work’s surroundings rather than just the work itself. Made with paint, fabric, paper and tape, among other materials, the stripes are part of interventions made in galleries, museums, and public sites. For the past fifty years Buren has mainly made works in situ. His pieces respond to the specifications of the particular location in which they stand. 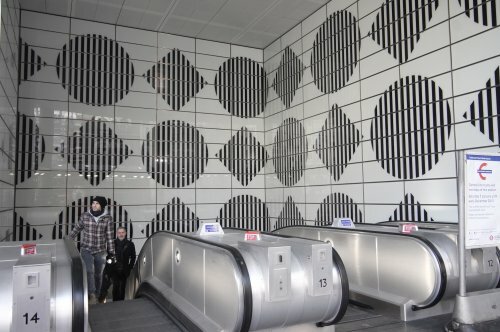 Buren’s works have become more sculptural and architectural, although the characteristic stripes are still a key element.